I was listening to WLW the other day as they were "discussing" politics. Specifically Eric Deters was saying that Romney won't get elected because he is a Mormon. He would then ask if anyone could imagine having more than one wife. It was incredibly offensive. "had Muslim in his family" like it was a disease. Deters said he thought so but didn't know for sure. It was incredibly offensive. Deters clearly knew the line of what was libelous, and wouldn't cross it himself, but gladly let the callers connect the dots for him. This type of action from Republicans has pushed me away permanently. Since Hillary is unelectable (will lose IL, MI, OH, and WI), it is Obama-time! Deters knows that the GOP is in tatters. Despite that, they could win against Hillary. She is one thing that unites the opposition. But Obama's message leaves the GOP fragmented. 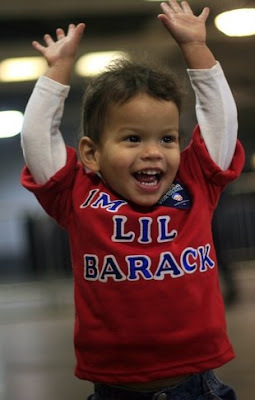 I am amazed that Obama has kept on message and positive this entire campaign. I think a new day is coming. The candidates on the right are far stronger than anything the Dems are offering this time around. That's pretty sad, considering the current administration's record. But it's proof that it is not the GOP in tatters, but the donkeys. Hillary is terrible, Obama can't win anywhere except the big cities. Candidates on the right have a message that hits home more with the heart of America; the left has lost its way from catering to a multitude of minor "politically correct" voices, the ACLU, and an undeniable, GOP-like desire (read: greed) for power. Obama is polling better and better in rural and suburban areas, so I think you are very wrong here. You don't think Bill and Hillary have greed for power? That they have less than some one like McCain? What you call catering to minorities, I call protecting the rights poor and oppressed. I don't beleive that the current GOP speaks to America, as I don't beleive America is about huge deficits, spending our children's inheritance on an unending war, extraordinary renditions for the purpose of torture, and Natavist demonization of immigrants. It is the GOP that has lost their way. You'll have to excuse my cynicism, but Obama sounds a lot like a redo of the 2000 'Uniter Not Divider' approach. Eight years later, I'd not vote for that strategy again. Obama might have a chance at winning the nomination for his party, but he hasn't got a prayer in the general election. Your vote is not a wasted vote; I really dislike it when people say that (example: "A vote for Ron Paul is a vote for Hillary!"). You should vote for who you believe in, and if Obama is your man, then so be it. Vote for him. Demonization of immigrants? So you believe in the 'DREAM Act'? Tancredo might be over-the-top for some people, but his powerful words about how we are united as a country by a single language are genuine -- and although you might not agree, alot of people in this country do. Protecting the rights of the poor and oppressed? That would be the middle class at this point.